Raj Thackeray is the founder and president of the Maharastra Navnirman Sena, a political party based in Maharashtra, a state in the western part of India. The name Raj Thackeray has almost become synonymous with the term ‘controversy’. In his career so far as a mainstream politician, Raj has managed to garner a lot of attention, but not always of the like that he's desired. Nevertheless, Raj has emerged as one of the major politicians of India in the recent years, and is a potential powerhouse for the future as well. 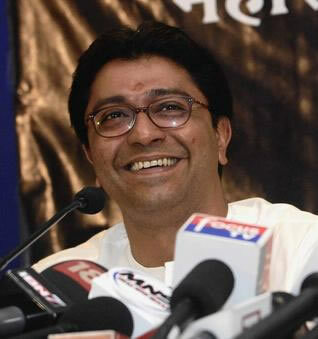 Raj Thackeray was born on June 14, 1968, in Mumbai, Maharastra, India. He was born to Shrikant Prabhodankar Thackeray and Kunda Thackeray, his father and mother respectively. Raj’s real name is Swararaj Shrikant Thackeray, which has been fondly truncated to Raj. Born in an illustrious political family, i.e. the Thackeray family of Maharashtra, Raj was naturally attracted to politics. However, he didn’t give in to it soon. After his schooling at the Bal Mohan Vidya Mandir School in Mumbai, Raj, like his uncle and Shiv Sena founder Bal Thackeray, showed keen interest in arts. He was very good at drawing cartoons and caricatures just like his once cartoonist uncle. Pursuing this interest, Raj graduated in arts from the Jamsetjee Jeejebhoy School of Arts in Mumbai. Post his education, Raj expressed a latent desire to become a cartoonist for Walt Disney, which wasn’t to be, as his calling was elsewhere. While he shared having the craft of painting with his uncle, Raj also shared his love for photography with his cousin Uddhav Thackeray, the youngest son of Bal Thackeray. Uddhav was personally interested in wildlife photography, but Raj was incurably attracted to his uncle, who had almost become a political stalwart by this time. Raj clicked various pictures of Bal Thackeray and even published them in a book titled ‘Bal keshav Thackeray’, which was released by none other than the legendary actor Amitabh Bachchan. Being under the influence of Bal Thackeray gave wings to Raj’s political aspirations. Soon enough, Raj was actively campaigning for the Shiv Sena ahead of its electoral battles. Raj was also made responsible for the youth branch of the Shiv Sena. During this time, he made many contributions to the party and also organized a big-scale musical concert that staged celebrities of the stature of Asha Bhosle and even Michael Jackson. The proceeds of this concert were used for noble causes such as the Shiv Sena’s loan scheme toward the unemployed youth of the region. Seeing that Raj’s stature had grown prominently within the party, many party workers within, and those outside the party as well, believed Raj to be instated as the next Shiv Sena Party President. However, amid speculations of rife, Shiv Sena chief Bal Thackeray announced that his son Uddhav would be the next party president. Following this decision, Raj resigned from the Shiv Sena at the end of 2005. It is widely rumored that Raj quit the party on being outcast and sidelined by the Sena chief, especially from the party president’s position. Yet, Raj has consistently maintained that he had his own reasons to withdraw from Shiv Sena. After Raj’s split from Shiv Sena, many party workers in his support and those who felt disgruntled at Raj’s ostracism in such fashion, followed suit and promptly resigned from the Sena as well. However, Raj and his band of supporters united once again to work for a political party, but this time the party was going to be Raj’s own, which he named the “Maharashtra Navnirman Sena (MNS)”. Raj opined that the MNS would fiercely and earnestly fight for the integrity of ‘Marathi Manoos (the Common Marathi man)’, a trait which he believed that the Shiv Sena was no longer capable of. From its founding in March 2006, the MNS observed a fairly quiet existence for the first year. However, in the coming years and especially in the year 2008, the MNS caused no less furor. 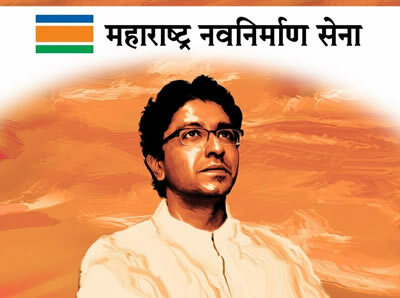 Raj Thackeray was primarily at the centre of all activities carried out by the MNS. Be it MNS’s acrimonious stand against the migrants coming into Mumbai, its attempt to ban Australian players from playing in the IPL as retaliation for Indians being attacked down under, or for haranguing actress and MP Jaya Bachchan for her snide remarks against Maharashtrians. Raj grabbing all the major headlines had become a norm. Even after the MNS had achieved concrete ground in the political fray of Maharashtra, Raj did not relent from his aggressive stance. He believed in making things happen, and did so in many instances. Among these, the issue of signboards features prominently, where he asserted that the boards must also be in the Marathi language along with English. After Jet Airways had terminated a number of its staff as an effective cost-cutting measure, he successfully rallied against the management of the airline company to hire back its sacked employees. Raj also managed to kick up quite a storm for his expression of Anti-Bihar and Anti-Uttar Pradesh sentiments, for which he was jailed for a brief period as well. However, he was released on bail soon after his arrest. Raj also vowed to, in his own way, correct the media channels and the media persons, who allegedly tried to malign his image in public. The impact of Raj's competitive identity politics was clearly felt by all parties in the municipal elections. In Mumbai, the MNS got 28 seats in the 227-seat municipality. The Sena got 75. In Pune, the MNS beat the Sena, the BJP and the Congress. And in Nashik, it became the largest party with 40 in the 122-seat municipality. In other places though, it pretty much languished in single digits. Evidently, the Raj effect has distinctly rubbed on to the political fabric of Maharashtra, but it remains to be seen if Raj can take his uncle’s legacy forward, in terms of his own party MNS’s fortunes in the future. What is the Indian National Congress (INC)? What is the role of the Indian President? Why are tree leaves green in color? Why do fish need water?